PLAINVILLE - Norton Park was packed Friday as crowds gathered to see the annual spectacle of hot air balloons rising up before their very eyes. The Balloon Festival, perhaps Plainville’s most popular community festival, drew more than 120 vendors, multiple groups of balloonists and numerous families dotting the field with lawn chairs. Visitors snacked on festival food, sipped on lemonade and listened to live music as the awaited the balloon glow and fireworks show during the festival’s opening day. Brenda Myska, who attended the event with her husband, daughters and a friend of one of her daughters, said she has been coming a long time. “It’s one of my favorite parts of the summer,” she said. Donna Solis, who lives in Bristol but grew up in Plainville, said she has been coming to the Plainville Balloon Festival since it started 34 years ago. Leslie Stansfield said that the festival is “very relaxing.” She said that she loves the craft show and purchased a lot of baby books for her grandson. Paula and Glenn Sabine, from Northford, were newcomers to the festival. They found out about it on Facebook and came with their son and daughter. Walter Sisco, from Southington, has been coming to the festival for 15 years. Sisco came to the festival with his son, his grandson and his wife. Balloonist John Bond and his family from South Windsor have been coming to the festival for six years and Bond had been a balloonist for 30 years. 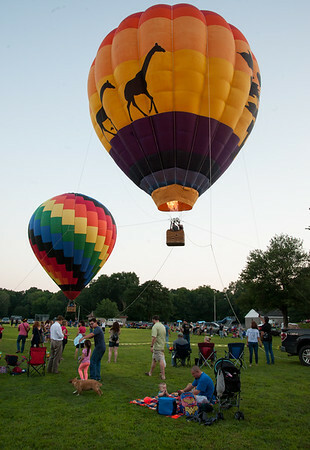 They participated in the balloon glow in addition to flying their balloon around festival grounds. Bond said that his balloon is 77,000 cubic feet, a mid-sized hot-air balloon. It can usually carry three people depending on conditions. Bond said that he enjoys when people come running over to see the balloon when it lands. He said that in the past he has then tethered the balloon and taken some people up for a bit. He said that they told him that it made their day. Another balloonist, Bob Sommer, said that he had the “oldest flying experimental balloon in the world”, built in 1975. He has been a balloonist for 44 years and brought three hot air balloons with him to the festival. Two of the three balloons were 77,000 cubic feet and the other was 88,000 cubic feet. Sommer said that a lot of his co-workers from ABB came to the festival with him. The craft show featured vendors items ranging from beef jerky to quilts to candles to psychic readings. There were also booths for local businesses, organizations like the Rotary Club and the local political parties. Town Council Chair Kathy Pugliese was at the Republican Town Committee booth, where visitors had an opportunity to meet their local legislators and candidates. Plainville Fire Chief Kevin Toner said he that he didn’t think that the festival could be any better this year.
. 8:30 a.m. – Busses begin running from parking lots.
. 6 p.m. – Balloon launch, buses run until park is cleared. Posted in New Britain Herald, Plainville on Friday, 24 August 2018 21:23. Updated: Friday, 24 August 2018 21:26.